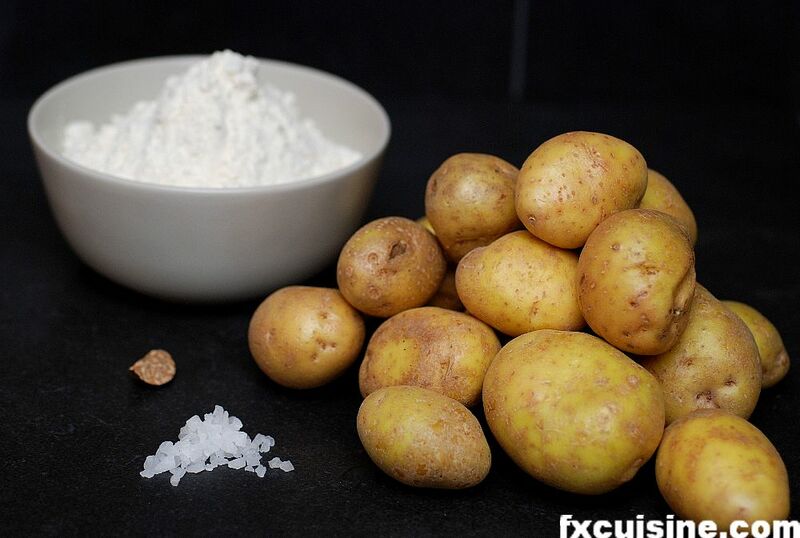 Boil the potatoes with their skins on, or steam them without their skin, until they are soft but not mushy. Purée them in the finest grinder you have. Chunks and little black spots are not cool and they will show. If you don't believe me please check my pictures carefully and you'll see what I mean. Add the flour until you get a smooth paste, not too soft. You can add an egg but it's not really necessary. The more flour, the harder and heavier they will be. In Napoli in the 18th century they made it with flour only - great if you need to choke a priest but not very light. Potato-based gnocchis are much superior and used everywhere in Italy nowadays. My gnocchi dough is not very smooth and is quite chunky. Use a finer grinder than I did. 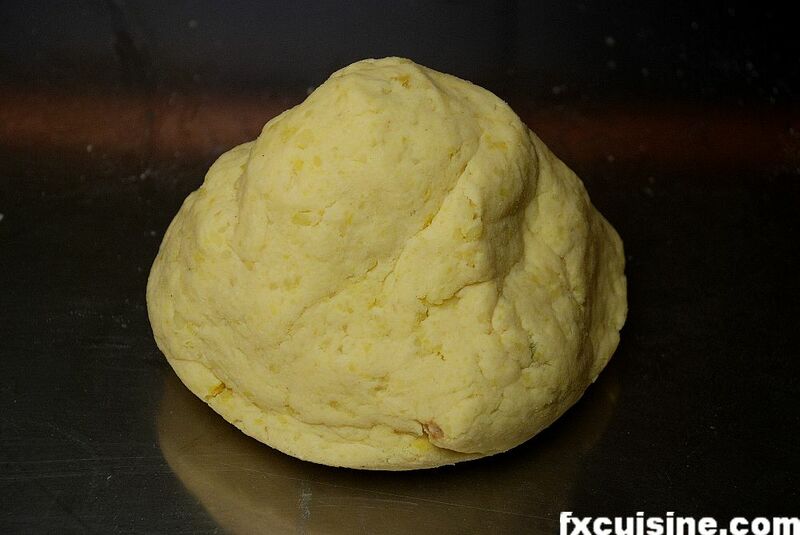 Cut a small piece of dough and roll it on lightly floured work space. The roll should have the same diameter as the base of your medium finger. 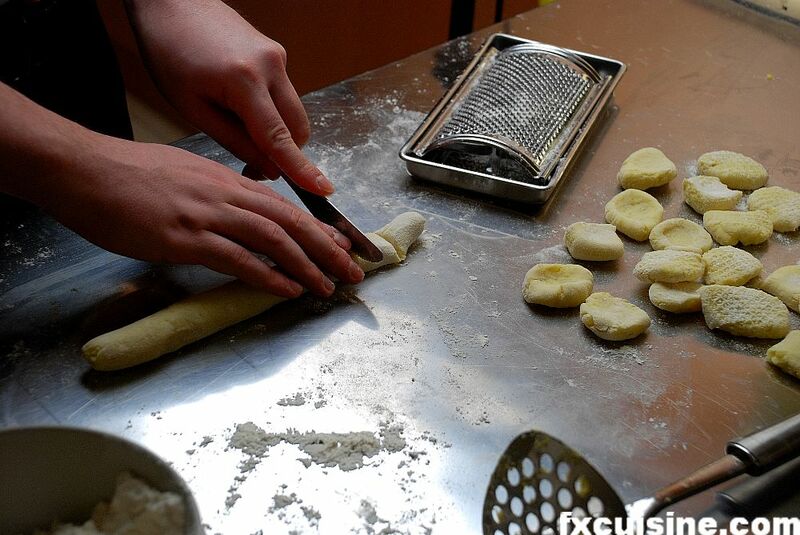 Cut pieces of dough from the roll about the size of a knuckle of your thumb. 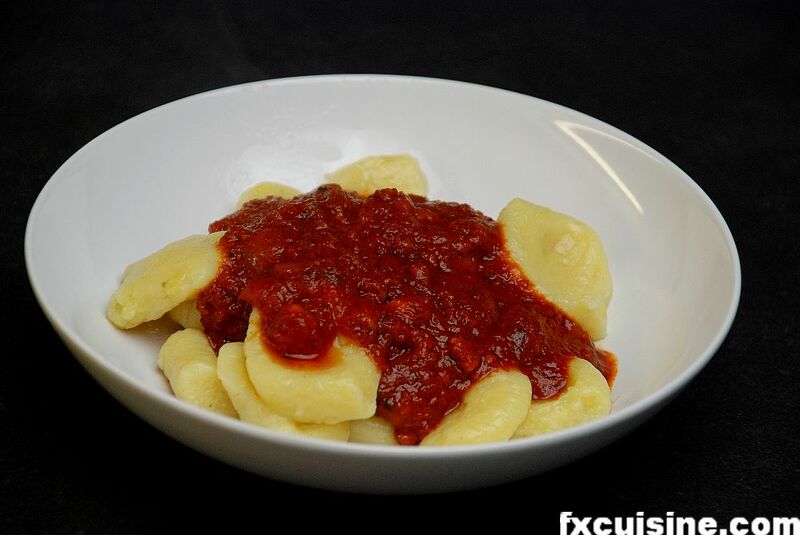 If the cooking time makes the ragù, it's he shapethat makes the gnoccho. Hastily made gnocchi have no shape - they look like small barrels. 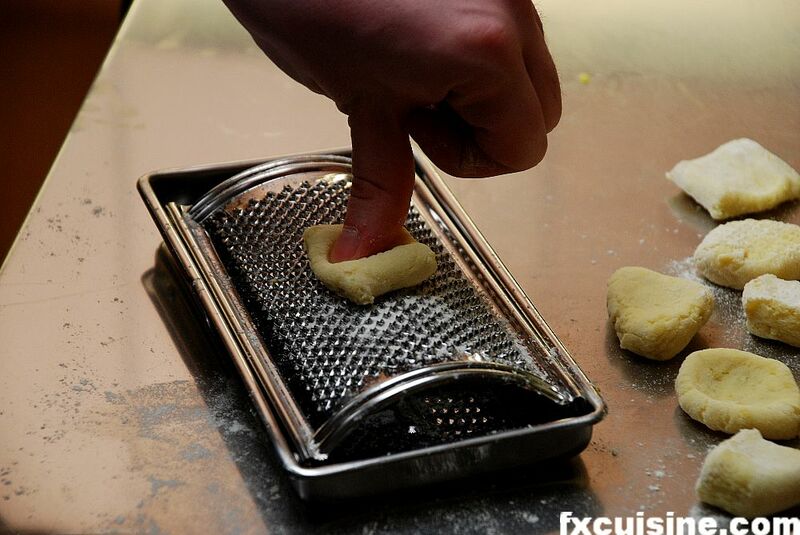 By pressing each gnoccho gently on a fine grater or a bamboo mat, you will make it thinner, curved on one side and marked with little cavities on the other. This will result in a lighter gnoccho to which a much larger quantity of ragù will stick. They are also more appealing to the eye. These are not the nicest gnocchis ever, but I made another batch the next day with much nicer results. Both tasted the same, so good luck! Bring salter water to a high boil and don't add oil no matter what your daddy told you. 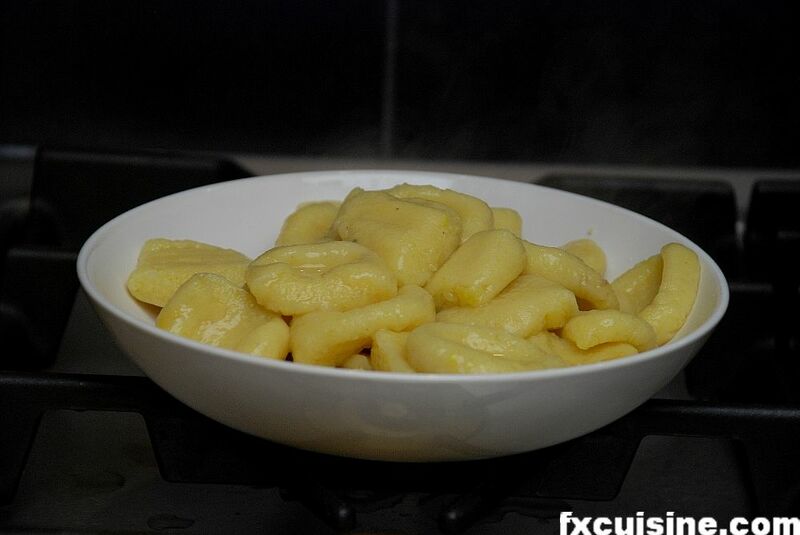 Prepare the gnocchis on a plate or in a folded towel. 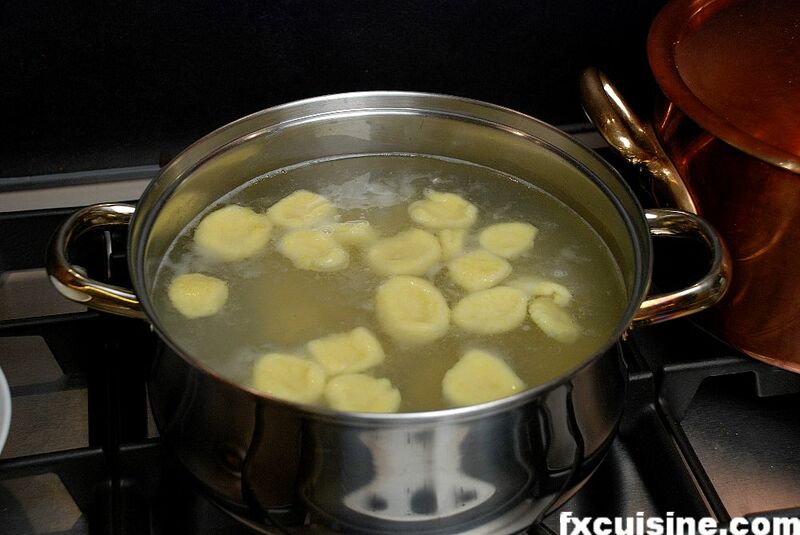 Pour all your gnocchis in the boiling water at the same time. 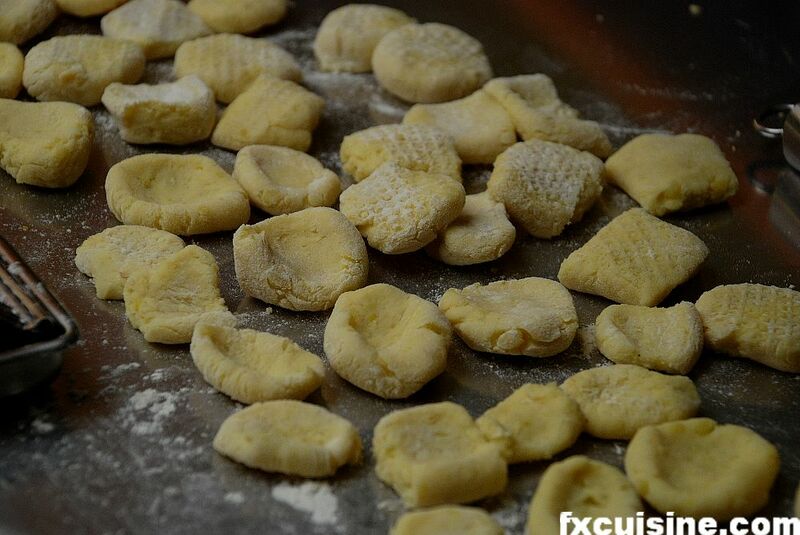 Increase the heat to maximum to compensate the temperature drop due to the cold gnocchis and don't cover. Really don't. Covering a pot of cooking pasta is said to be enough ground for a divorce in Naples. Your gnocchis will be cooked when they come to the surface. Eat one to make sure. Using a slotted spoon, take them out and put them in a strainer. Don't, please don't, pour down gnocchis and water into a strainer. This will break the gnocchis and overcook them and just shows poor taste in a kitchen. 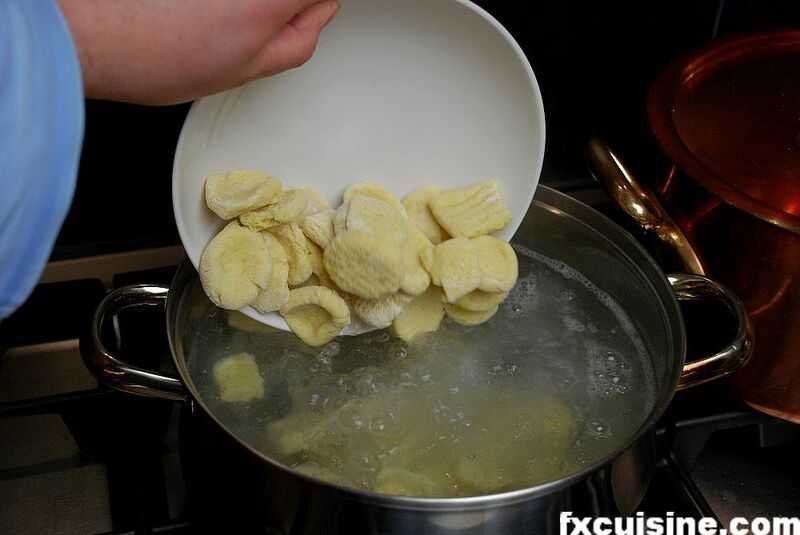 Heat the serving plates with a ladleful of hot cooking water, shake the gnocchis in the strainer so excess water falls off and put them carefully in the plates. Finally, the gorgeous strangolapreti are ready to serve in the luscious, velvety dark red ragù. This really is a fantastic dish, well worth the effort. The recipe is for 4 large portions or 8 as a first course. You can definitely make the ragù the day before, keep it in the fridge and remove the tiny spots of fats that will come up on top the next day. My recipe comes from the monumental La cucina napoletana by Jeanne Caròla Francesconi, a monumental 750 pages long tome about every traditional napolitan dish and its history. It has a long, passionate discussion of the ragù, its origins, cultural importance in Naples and accepted variations. If you read Italian this is a must. Although it has no pictures, it still is one of my 10 favorite cookbooks, and I have many. Oh - the pig roast. Well, you can serve it a second course or in an entirely different meal. It only serves to impart porky flavor to the sauce and is never eaten with the sauce. Good luck and let me know how you fare with this dish! Strong-flavored rustic gnocchis served with an alpine seasoned cheese. Eat five and choke. describing as a "pig roast" typically called a "pork loin" in the U.S. Please advise, thank you- Chris. Christopher, nowadays many people do not use the big chunk of pig when making this sauce. Basically you have to take a large piece of pig and wrap it with bacon and herbs and tie it up. I didn't do this here and hope to redo this recipe to show how it's done. Christopher, thanks for your message. The meat to be used according to Bugialli is beef rump roast which you need to tie up like a salami. But the authentic recipe calls for either a "prime cut of veal or pork" ('Primo taglio di vaccina o di maiale') which you need to lard with tiny pieces of prosciutto and then wrap and tie up with parsley sprigs and slices of pancetta. You also add 3 pork ribs no matter what meat you used for the roast. I hope this helps! Ciao Giovanni, thank you so much for your comments. I definitely have to redo this recipe with better ingredients and need to add your pigskin parcel. Hello! My friend told me about your food blog, and although I haven't gotten a chance to try any of the recipes, they are beautiful! And the pictures are mouth-watering as well. I was wondering, would it be possible to transfer the sauce to a crock pot for the 7-hour simmering stage? Thank you! Thank you Lindsey, you can definitely transfer it to a crockpot, have a look at my last article 'Pasta for the Sopranos' where I do the ragù just like this. A delicious dish indeed! Hi One of the best locations I've come across lately!!! Definately a permanent bookmark! 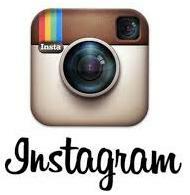 Would you please also visit my site? I absolutely love your site. I just happened upon it tonight and have bookmarked it. I will most definitely try some of your recipes. They are unique, explained well and are funny, too! This is the best "find" I've come across in months! Thank you! Hi all! Wow!!! Your site is beautiful!! I love the artwork. Looks fantastic; I will try the recipe soon.Just a minor point of English: a "priest strangler" would be a person who grabs a priest by the neck and squeezes until the priest dies. A gnoccho which gets stuck in a priest's esophagus, causing him to asphyxiate would be called a "priest choker". I made the gnocchi today - they were delicious with pesto for lunch. I will make the ragu this Saturday for guests Sunday night. I'll let you know how it goes. There is a local firm (Fatted Calf, here in San Francisco) and a national firm (Niman Ranch) that make guanciale. I will serve your fire-roasted peppers as a first course. Oh, one question - there is no cheese in the photo, or in the description. Is this dish not traditionally served with grated cheese? Another on my list to try.. I often make a bolognese ragu that "only" takes 4 hours. ;-)You talk about 'pureeing' the potatoes with a 'grinder' (maybe you mean a food mill). I've never made potato gnocchi but here I would try using a potato ricer (a two-handled gadget with a plunger that pushes the potato through small holes, with the resulting product resembling cooked rice). No lumps! I've never had good luck with the food mill and potatoes.Joe, in Italian there are related transitive verbs with the same root. So, to 'strozzare' someone is indeed to strangle them. To 'strozzarsi' means to strangle (yourself) on something, i.e., choke. That's why the literal translation may sound odd to Anglo ears. Of course, if you're the one serving the priest, you're indirectly guilty of the strangling! I hadn't heard of any particular priest being the victim.. I had gathered that priests were often viewed as 'golosi' (greedy, gluttons.. perhaps due to their restrictions from other vices) hence they could easily choke while (quickly) eating such thick, chewy morsels. 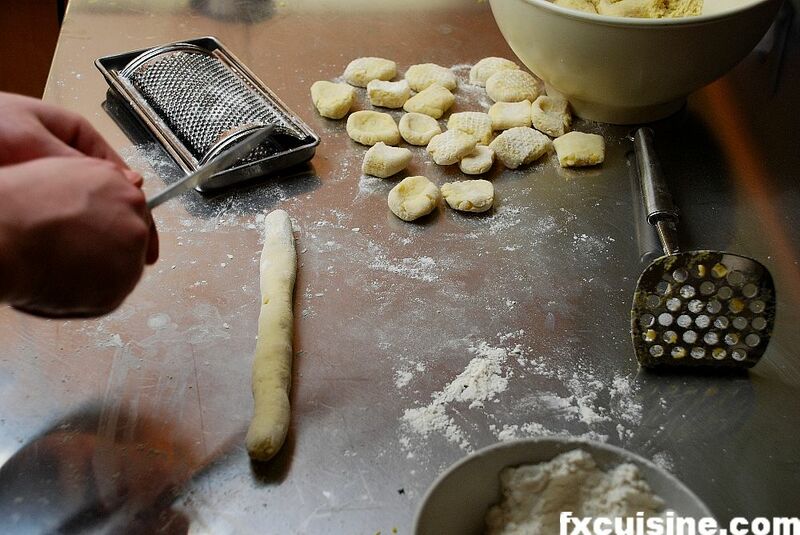 In other parts of Italy the same name, strozza/strangolapreti, is used for a number of flour-based pasta forms as well (no potato), or even for large 'gnudi', which are ricotta/spinach dumplings. There's no one canonical (wink) 'strozzapreti' recipe. I made it yesterday and cooked it as recommended the full seven hours. The result was stunning. The last five hours, while the ragu simmered, was no trouble at all - just the occational stir. Is there a way to print this recipe without the very large (and beautiful) pictures? My son cooked this ragu yesterday and tried in vain to print just the text. Instead it took 18 pages, because the size of the illustrations couldn't be reduced or avoided. Leila I will make some changes to enable picture-free printing. That will be best for everyone's environmental karma I suppose! Leila, I now have made a print version accessible from a link right below the title of every article. No pictures, no ads - just the text. Great recipe! Worth the time. I tempered the excess gnocchis in an ice bath. They can be kept in fridge for 2 days and re-heated as needed. Fred, I'm so glad you tried my recipe! 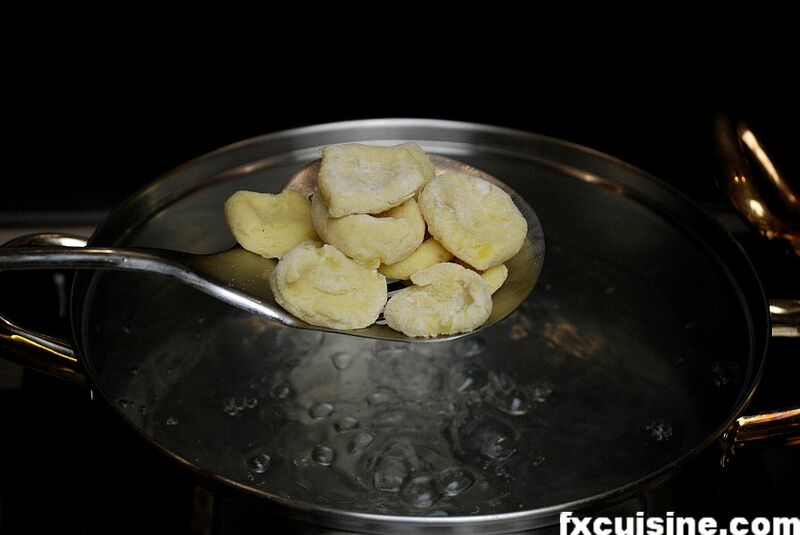 You can definitely reheat the gnocchis with a little butter in a saucepan, this will add a little crispiness. If you parboil them again they might become soggy. Hier, j’ai fait la sauce ragù (qui en passant était succulente) ainsi que les gnocchis que j’ai prépare à la dernière minute. Je me demandais si c’était possible de préparer les gnocchis à l’avance. Si oui, combien de temps et est ce que c’est différent si je met un œuf ? Merci et mille fois bravo pour ton site! Karine, bonjour et merci pour ta visite! Tu peux faire les gnocchis avec un oeuf, des bonnes pommes de terres bien farineuses et aussi peu de farine qu'il faudra pour qu'ils tiennent. Il me semble que tu pourrais préparer la pâte la veille et faire les gnocchis le jour même, mais je ne te recommanderais pas de les précuire. Le plus long est de faire cuire les patates et de les peler, le reste est facile et rigolo, tu peux même demander à tes invités de venir t'aider à les mettre en forme, ça leur fera une soirée vraiment mémorable! I've been following your website for about 7-8 months now and your combination of recipes plus macro photos is amazing. You do amazing work. I appreciate all of your napolitana sauces and recipes however doesn't the simmering for 7 hrs make these sauces too acidic from the tomatoes? Is there anything you do to counteract this? I just don't like adding sugar to my sauces...let me rephrase that...I will absolutely never add sugar to my sauces. Jarrett, thanks for stepping out of the digital woodwork and into the the comments section! You could, if nobody was looking, add a very tiny wee bit of sugar if your sauce is too tart, but I find it rarely necessary. Just taste it by the end and make a judgement call to correct the balance. Good luck and have fun! FX's answer→ Grazio, welcome to FXcuisine, you must be our youngest reader so far and already well versed into Italian cooking as I can see! If you had a complete recipe for the Sunday Gravy, including some details as to the part of Italy the people who cook this came from originally, I'd be very interested. Thanks and good luck for your future career as a chef! There is nothing better than a slow cooked ragu. I have been making a Bolognese ragu for years. It's a labor of love but well worth it. Your presentation is excellant. I will try to make this recipe soon. I also enjoyed reading all the comments. Very thoughtful. I have a few questions, etc. on the recipe. The pork fat is not shown in the ingredient picture. I have been using salt pork for years and assume this is OK. The directions did not indicate to render the pork fat before adding the ground meat. I assume this is correct? Do you brown the garlic and remove it from the oil prior to adding the ground meat or grind it together with the meat? Browning the garlic and removing it sounds correct. The 2C of water are not on the ingredient list or in the ingredients picture. Not an important point. The comment to add pork skin in phase two is something we do all the time. Rolling it up with spices and tying it is a brilliant suggestion. The meat stacked in the picture looks like panchetta or guanciale on top, thick sliced boiled ham or ham steak in the middle and prosciutto on the bottom. Your ingredient list calls for bacon? I do not see it. Enough of my picky comments! Great recipe, great presentation and narrative. Kudos chef. I can't wait to read more of your recipes. FX's answer→ Mike, sorry for the late answer. Yes, you do need to render the fat or else add olive oil otherwise the ground meat with burn. Many people fry the garlic in oil, then remove the garlic and throw it away, since much flavor has been passed to the oil. Normally I don't include water in the ingredient list unless it is a recipe meant for desert explorers. Have fun! Can someone help me please.... at what point do you add the Pork Ribs? - do they go into the mixer with the bacon and ham at the start? - or do they go into the pot whole at a later stage? I made this sauce...cooked it for the whole 7 hours, and i nearly strangled myself eating it. It has the most delicate flavour. Slow food is king. Take pleasure seriously! Thanks. FX's answer→ Glad this worked for you David! what do i do with the pig roast when i am done cooking? would it be possible to make this sauce in a (much) larger quantity. I have concerns that the tomato paste would not caramelize properly if i attempted to double or quadruple the ingredients. 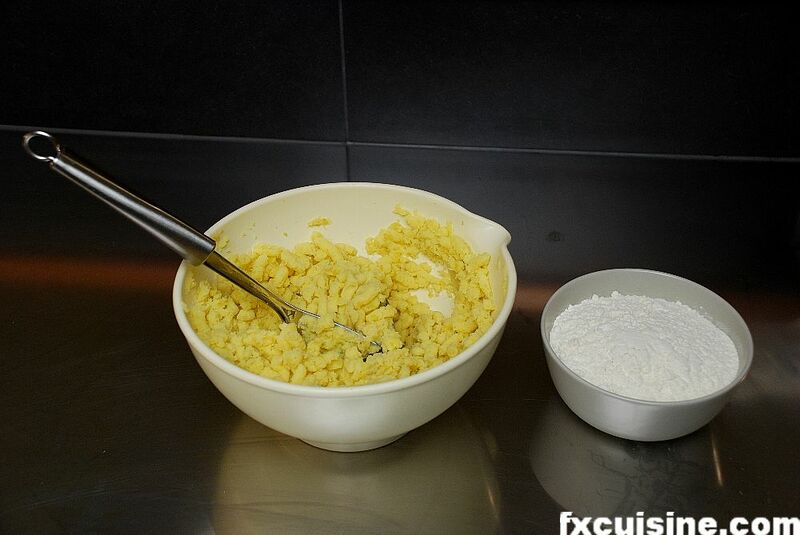 FX's answer→ Matthew, you would need either a larger pan or to proceed in several batches. I will try it after I retire later this year - can't wait !